What’s left is a voice that may once have told its story as a weeper but now knows, ineluctably, it is threaded with comedy. Yes! When I was in grad school (2001) and read a particular excerpt aloud to an audience, a passage that to me had been heart-wrenching, tragic even – they roared with laughter! I couldn’t believe it! Why were they laughing at my pain… Well, that was then and this is now… And only time could bring me to the point where, if I couldn’t laugh at myself, I could at least see why others thought it funny. 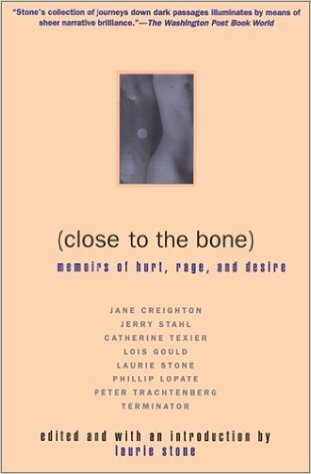 This entry was posted in ART, Memoir and tagged alchemy of memoir, autobiography, Close to the Bone, Laurie Stone, memoir, memoir writers, Nancy Wait, on writing, self-knowledge, self-scrutiny, the nancy who drew. Bookmark the permalink. Absolutely! Timing changes perspective. I had the same experience before when reading part of my memoir to a group of women. They laughed and then I laughed louder and deeper at my own folly. Thanks for sharing the insights from Close to the Bone.